Space is a profound and infinite mystery. However, it is no mystery that these cement tiles are individually hand-crafted, and that their deep, timeless shade of blue will never wear off due to the thickness of the colour layer. Furthermore, the different shade gradients and slight variations of the tone, create a warm, welcoming effect, and these handmade encaustic cement tiles are full of charm, personality and character. Amber is a fossilized tree resin characterised by its colour, and these handmade encaustic cement tiles capture that same rich tone. Each one is individually hand-crafted, and the warm shade of reddish-orange will never wear off due to the thickness of the colour layer. Furthermore, the different shade gradients and slight variations of the tone, create a warm, welcoming effect, and these encaustic tiles are full of charm, personality and character. The game of Backgammon originated in the Middle East about 5,000 years ago. Step back in time as you walk on these exquisite beige and white encaustic floor tiles. Let their precise interlocking triangles remind us of the long history of one of the world’s oldest known board games and the ancient hand-made process that goes into elaborating these fine handmade encaustic cement floor tiles. Each of these handmade encaustic cement tiles has a rich black background with four stylised leaves in white which form a unique circle and star design. These stunning decorative tiles will look fantastic on a wall or on the floor, and their 8-mm thick colour layer means that the crisp, clean lines will keep their contrast and colour for many years to come. Diamonds come in many different shades, but natural black diamonds are the among the costliest because they are exceedingly rare. However, you can afford to cover your floor with them thanks to these unique handmade encaustic cement floor tiles. And, just like a real diamond, these handcrafted encaustic tiles are super hard, so they will keep looking good for years to come. Pyramids have graced our planet with their majestic beauty for thousands of years. You can bring some of that historical magic into your home with these Black Pyramid handmade encaustic cement tiles in deep black and clean white. 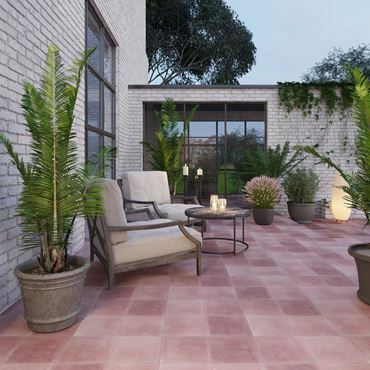 Just like the pyramids, these cement tiles are crafted by hand from high-quality materials, and the 8-mm natural colour layer will keep them looking good for many, many years. ‘Coco’ brought her individual style into the fashion world, and the name Chanel has become synonymous with elegance and quality. These handmade encaustic cement floor tiles also bring you their own original style with their small intricate design and their long-lasting natural colours. Bring some class into your home with these impressive bi-colour encaustic tiles, which, with their small design are ideal for a smaller space. Cornflowers are valued for their unique blue pigment. Each one of these handmade encaustic cement tiles is individually hand-crafted using natural pigments and the pale shade of blue will never wear off due to the thickness of the colour layer. Furthermore, the different shade gradients and slight variations of the tone, create a warm, welcoming effect, and these encaustic tiles are full of charm, personality and character.